One of the most popular propaganda generators is OOA / "Opposite of America" Facebook page, created by US Uncut, which is probably another George Soros funded front group. (Not disimilar to ThinkProgress, MoveOn, OccupyDemocrats, or many other sites that exist to misrepresent truth for the sake of an agenda). Despite claims that they're "grass roots", all the groups they associate with have ties back to Soros organizations ( Black Lives Matters, Occupy, etc), and they all, got funding directly or indirectly from the same places -- and have all claimed to be "grass roots", only to be discovered as astroturf (fake grass roots organizations, sponsored by activist organizations). If you read the fine print, they admit the quotes are made-up, "it’s not too different than the Onion. We aren’t trying to fool anyone and we don’t use fake quotes on anything else". Oh, other than the actual key meme's they propagate? Which actively deceives the gullible that don't know better?! But worse than that, is the facts/implications behind the meme's are even more misleading or flat-out falsehoods and lies than the quotes themselves. Walmart is a low income and low margin businesses (across all of America). 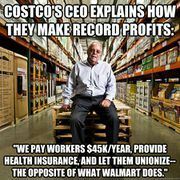 Costco is "Walmart for the Wealthy" in select areas, and thus brings in more revenue per worker (3x as much), keeps more of it for themselves, even with higher worker salaries. The real choice is whether you want workers to have jobs at Walmart or be on unemployment. Actually, the U.S. spends more on education than on the military, it just doesn't do it at the federal level (most is at State and Local). 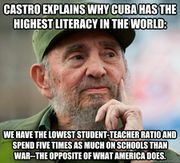 The U.S. spends more per student than the average Cuban income, and Cuba spends so little on the military, because they're a small Island that got military subsidies from USSR and Venezuela. 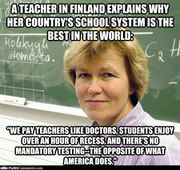 A more accurate statement is that while Finish teachers earn less than American ones, their doctors earn about the same as our teachers. And they aren't the best in the world, unless you measure time for recess. Switzerland currently has no minimum wage and no limits on CEO pay and bonuses! One problem: Iceland bailed out its banks, at about five and a half times times the relative costs that the U.S. did! They have a lower debt than we do (28% of GDP, where we hover in the 100% range). They have a lower corporate tax rate than the U.S. does too, so perhaps that's the cause of the lower debt? They do have a surcharge on oil/energy that makes that ONE tax as much as 78%: which is why gas costs $10/gallon over there. 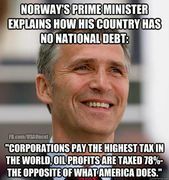 And they collect a lot more of their tax revenue from VAT tax than from oil or corporations, so taxing oil profits isn't why they have a low debt ratio. Their social programs are capped based on supply-capping (what goes it is based on how much income they bring in from taxes), while ours are based on demand. Perhaps we should look at doing that? Basics of Propaganda: understanding differences between white, black and grey propaganda.